Want to become a cloud hosting provider? 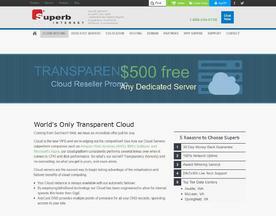 Cloud Reseller Hosting offers the latest cloud infrastructure for you to re-sell to your own customer base. The flexibility of cloud hosting allows you to set your own service plans, platform and pricing. Many providers will offer a white label product for you to rebrand and provide a software platform to easily manage your clients. Get limitless flexibility + scalability on the world's only TransparentCloud, with guaranteed performance and zero overselling. Slice and dice your resource pool any way you like, easily meeting each and every client's needs, while automatically paying less than more you grow. Start as a WholesaleCloud reseller and get $500 off today!